How it all began - setting the scene. Hello. This blog will tell the story of our garden, how we brought it back from neglect, and all the ideas and changes we have made, and plan to make, as well as our day to day experiences gardening on a steep chalk hillside overlooking the River Avon in Wiltshire. As I cut back the ever-expanding Shasta daisy clump to the ground in August this year, it reminded me that although not in the same place, this was one of the original plants flowering in the garden when we first saw it in early August 12 years ago. We were about to take voluntary redundancy, and were looking to move away from our tiny West London house and garden, to a “project”, both a do-er upper house and a big garden so we could grow vegetables and build up a garden. We had seen many properties before this one but we came through an empty and rundown house, saw the view out of the back window and went straight out into the garden. We were on the crest of a hill looking across the Avon Valley. 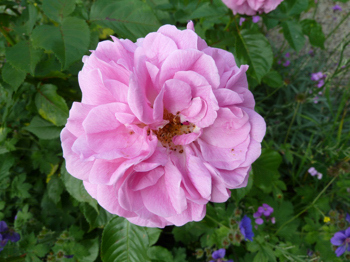 Pink roses with a beautiful fragrance bloomed near the house, and then there was an enormous square rose bed full of old roses in the middle all straggly and full of black spot, ribbon borders of overgrown shrubs either side. Then came three pear trees, and a swathe of chalk grassland with a big Victoria plum tree in fruit in the middle of it. Then an out of control hedge of Lonicera nitida across the whole garden, with a breezeblock shed with corrugated asbestos roof behind it, and a wrought-iron gate through it at one side. The other side was frankly scary. 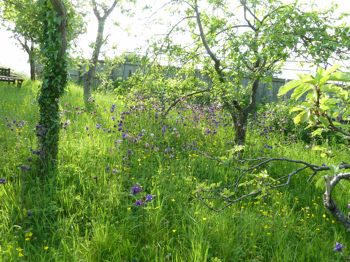 A wild, overgrown wilderness higher than a person with a path hacked into it at the right hand boundary, to allow intrepid viewers to push down to the orchard. And I do mean orchard. Four plum trees with small black skinned plums came first, then two dwarf apple trees, four Victoria-type plum trees, four apple trees, two more of the black-skinned plum trees, and then an enormous apple tree. Beyond that, though we couldn’t get down there, we would eventually find two cooking apple trees and two more pear trees. The bottom of the garden had a huge ash tree to the right hand boundary shading out several apple trees, and a wild cherry tree at the very bottom. As we slowly made our way back up the steep slope to the house, we had already decided, whatever the house was like we were going to move to this garden. We moved in at the end of November that year, and the pink roses were still flowering. I don’t know about your priorities, but when we began to plan a house move, I started keeping plants in pots, dividing clumps of hardy perennials, taking cuttings and collecting seeds of favourite plants, digging up some alliums, and in the case of my peonies, potting them up into enormous plastic pots ready for the move. We negotiated with the vendors that we could bring some plants down and leave them here in pots before completion, and in fact hired a long-wheel base, high top transit-type van, making three trips with pots of plants over one weekend. As we started to heave the largest peony in its pot out of our garden in London my husband and I dropped it – a mouse had popped its head out from under a tuber, and thought about making a break for it, then shot back into its hole. What to do? We changed places so that I was guarding the hole, and carried it to the van. At the new house, as more and more pots were removed from the van, leaving the peony in the corner, where was the mouse? I moved pot after pot, and then spotted it. I hadn’t developed such a good herding technique with unexpected wildlife at that point, so it took me a few goes before I managed to persuade the mouse to vacate the van through the open side door. It shot out, straight under a decrepit planter at the end of the drive, and we never saw it again. I do hope the local mouse population could understand the accent of the city mouse, and that it wasn’t a meal for a tawny owl immediately. Approximately 9.4 meters (31 feet) wide, more than 95 meters (312 feet) from the back of the house to the bottom boundary, and dropping a minimum of 10.7 meters (35 feet) unevenly, or 1 in 10 or worse, this is a very sloping garden. We soon learned several things:- that the prevailing wind came from the west or northwest, straight down the garden, or diagonally from left to right, (and there was a lot of wind – this is quite an exposed garden); the sun rose at the foot of the garden, and travelled round the right perimeter, setting over the house at the end of the day; and most importantly not to fill a cup with more than 2/3rds liquid, as there was nowhere flat to put it in this garden. Although I knew that having a south-facing garden was the ideal, and that vineyards needed to be on a west-facing slope, I hadn’t appreciated the impact of being on an east-facing slope in designing a garden. It took me some time to realise that the fact that the house blocked the sun from my washing on the top lawn by 4pm in all but the height of summer was a reality that continued all down our sloping garden. All such a difference from our tiny triangular flat plot in West London, where we gardened on clay, and enjoyed the London microclimate. Over the coming months I hope you will share with me our gardening efforts here, as we turn our plot into the garden of our imagination. 4 Comments To "On a Chalk Hillside November 2016 (1)"
Hi Sue, I am not sure at all but did wonder if it was Rosa Ispahan. The scent is beautiful, and the flower looks the same. It does repeat flower, which I am not sure if Ispahan does?